Robust, tufted or shortly rhizomatous perennial; culms (100–)120–180 cm. high, usually unbranched. Leaf-sheaths glabrous; blades linear, 50–75 cm. long, 5–15(–20) mm. wide, tapering at the base, flat, glabrous or pilose, acuminate. Panicle usually erect and spreading, ovate to oblong, 30–60 cm. long, much branched. Spikelets ovate, (2.8–)3–4(–4.2) mm. long, pallid, often purple tipped; lower glume 1/2–2/3 the length of the spikelet, ovate, 5-nerved, acuminate; upper glume ovate, 7-nerved; lower lemma (7–)9-nerved, male, its palea well developed; upper lemma pale and glossy. Wooded grassland on sandy soils; 450–1800 m.
In savanna, on dry soils. Robust, tufted or shortly rhizoinatous perennial with erect culms 100–200 cm. high. Leaf laminae 50–75 cm. long and 5–15(20) mm. wide, linear, acuminate. Panicle (20)30–60 cm. long, ovate to oblong, moderately branched. Spikelets 3–4 mm. long, ovate; inferior glume 1/2–2/3 the length of the spikelet, ovate, 5-nerved, straight or recurved acuminate; superior glume 7-nerved, acuminate; inferior lemma 7–9-nerved, its palea well developed, enclosing a male flower, superior lemma pale and glossy. Perennial; caespitose. Rhizomes short. Culms robust; (100-)120-180 cm long. Lateral branches lacking. Leaf-sheaths glabrous on surface. Ligule a ciliate membrane. Leaf-blades tapering towards sheath; 50-75 cm long; 5-15(-20) mm wide. Leaf-blade surface glabrous, or pilose. Leaf-blade apex acuminate. Inflorescence a panicle. Panicle open; oblong, or ovate; 30-60 cm long. Primary panicle branches 15-25 in number; 3-5 -nate. Spikelets solitary. Fertile spikelets pedicelled. Spikelets comprising 1 basal sterile florets; 1 fertile florets; without rhachilla extension. Spikelets ovate; dorsally compressed; (2.8-)3-4(-4.2) mm long; falling entire. Glumes similar; reaching apex of florets; thinner than fertile lemma; gaping. Lower glume ovate; 0.5-0.66 length of spikelet; membranous; without keels; 5 -veined. Lower glume apex acuminate. Upper glume ovate; 1 length of spikelet; membranous; pallid, or purple; without keels; 7 -veined. Upper glume apex acuminate. Basal sterile florets male; with palea. Lemma of lower sterile floret similar to upper glume; ovate; 1 length of spikelet; membranous; (7-)9 -veined; acuminate. Fertile lemma oblong; dorsally compressed; 2.8-4.2 mm long; indurate; pallid; shiny; without keel. Lemma margins involute. Lemma apex obtuse. Palea involute; indurate. A. Chev. in Rev. Bot. Appliq. 14: 21. Jackson & Wiehe, Ann. 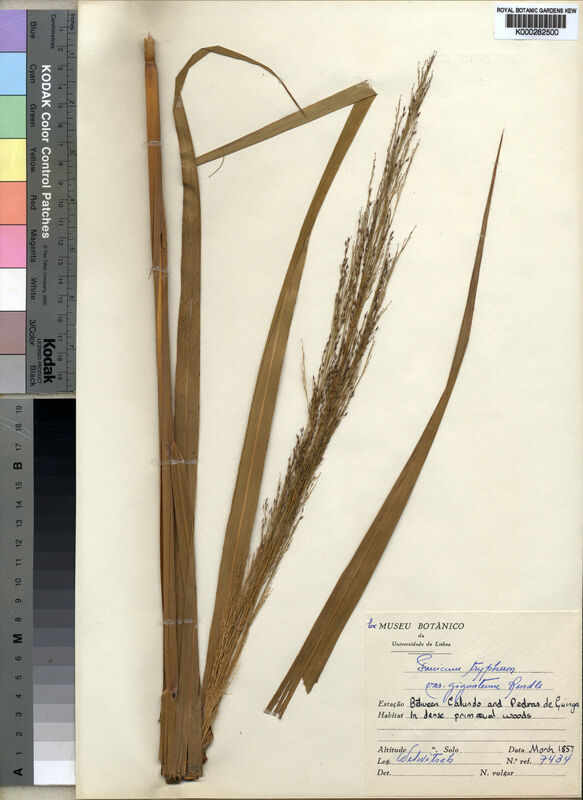 list Nyasaland grasses: 52 (1958). Robyns, Fl. Agrost. Congo Belge 2: 192 (1934). Stapf in Flora of Tropical Africa 9: 677 (1920).